If all of a sudden you had superpowers, what would you do with them? Every child's dream becomes a reality for one down-on-his-luck foster kid in SHAZAM! #1, as the iconic comic book character is rebooted once more with Geoff Johns and Dale Eaglesham. Diehard comic fans may be rejoicing that Johns is bringing the character of Shazam back to the page after such a long hiatus. But if you're like me, the resurgence of the red, white and gold superhero actually began when the trailer for the upcoming DC film of the same name dropped this summer during San Diego Comic-Con. Zachary Levi playing Shazam in live-action footage is actually the first time I've met this character, and his unbridled joy as he plays a kid who finds himself suddenly blessed with super powers was such a breath of fresh air after a decade of angsty big screen comic book fare. So, when I heard that DC was releasing a new Shazam comic book series, I thought it was simply to tie-in with the release of the film, and didn’t give it much additional thought. But after reading issue #1, I’ve now realized it’s so much more than that. This is a comic book to remind us all of how much joy there can be in superheroes. Having otherworldly strength, flight, magic and invulnerability isn't something to brood over—it can be fun too! Before Shazam! #1 gets into the meat of the story, it gives us a helpful intro into who Billy Batson and Shazam are and where these powers came from. A quick history lesson about the Rock of Eternity, the Council of Eternity and the last champion of magic is the perfect way to ensure that new readers are up to speed on the character's backstory. This three-page spread means that the rest of the book is not an origin story, so comic fans who already know how Billy becomes Shazam also have something to look forward to when the story picks up "today," where Billy and his five foster siblings get to show off their skills and foil a museum robbery attempt. Yes, that means there are six Shazam superheroes. In what was a surprise twist for me (though maybe not for readers more familiar with the character’s universe), Billy isn't the only kid here with superpowers, which lend the proceedings a much greater air of unpredictability. After all, six children with newfound superpowers adds up to way more hijinks as they all bask in the fun of being a hero. Watching two pretend to play baseball with one of the robbers is as amazing as it sounds. But it's not just the "Name TBD" super team that gets to have all the fun. Johns givea all the characters, important and random, hilarious lines and moments. The banter is top notch—see the unnamed cops making a report on the thwarted museum heist for a great example. When the kids can't agree on a name for their super group, one of the cops just says, "I'm starving. Let's just say ‘Superman’ did it." If that didn't make you laugh until you cried, maybe comic books just aren't your thing. Because, dear reader, I had tears streaming down my face. 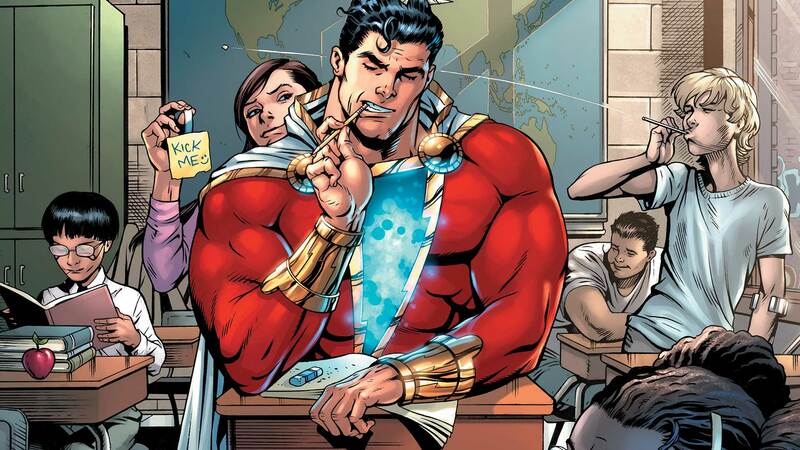 But in addition to all the light-hearted fun, the most important—and most impactful—part of this new Shazam series is the love at the center of it all. It's been one year since Billy joined his foster family, and in that time, he's grown to consider them all his real family. The love shared between not only the foster kids, but also their foster parents, is clear in every panel. There's no angst here. The superpowers pale in comparison to how strong the bonds are between every family member. And that makes the big twist cliffhanger all the more compelling. I won't spoil it here for anyone who hasn't read it, but as soon as I read the final panel, I was dying for more. The mystery surrounding Billy's past and what it means for his future, especially now that he's found such stability, love and happiness with his foster family, is one that is going to keep readers coming back for more. Plus, the addition of Mary's origin story is a happy bonus at the end! I can't decide what I love more: Mary finding a happy home after living with such monsters before, the wonderful way in which Mary and Freddy bonded for the first time or the origin story of that super bunny. As excited as I already was for the Shazam movie, Shazam! #1 has just solidified Billy and his family as my new favorite DC characters. SHAZAM! #1 by Geoff Johns, Dale Eaglesham and Mike Atiyeh is now available in print and as a digital download.